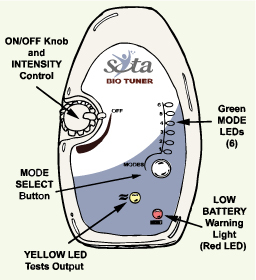 The SOTA Bio Tuner BT9 Product Manual SOTA Instruments Inc. Please read this manual thoroughly before using your Bio Tuner. This is the most up-to-date manual. With an implanted device such as a pacemaker, etc. Suddenly increase the intensity to the maximum level. The intensity should be increased gradually to a comfortable level to ensure safety. 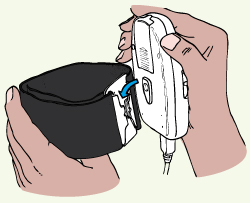 Connect the Bio Tuner Cord to any other USB outlet, such as a computer or power supply. Do not plug any other USB connections into the Bio Tuner, other than the Bio Tuner Cord. If you are on psychiatric medication, have a neurological condition or seizures, please consult your health care provider prior to using the Bio Tuner. In very rare instances, individuals have reported the onset or worsening of tinnitus when using the unit. If you experience tinnitus or a ringing in the ears, please discontinue use. 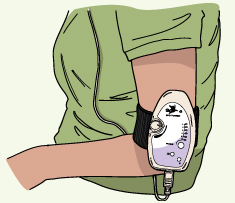 In very rare instances, individuals have reported experiencing headaches or nerve pain when using the unit. If you experience headaches or nerve pain, please discontinue use. YELLOW: Used for testing to ensure the flow of current through the Unit, Cord and Ear Clips. Position the 9-Volt Alkaline battery so the positive (+) and negative (-) terminals line up as in the image to the right. Note: The smaller circle on the battery matches the smaller circle in the case … the larger battery circle matches the larger circle in the case. Slide the 9-Volt Alkaline battery into the case and push down. Slide the cover back onto the unit. Clean the ear lobes to eliminate skin oils. This will allow for better conductivity. Slide the clip on the back of the Bio Tuner into the holding clip on the Arm Band. Insert the cord into the jack on the unit. The USB symbol on the plug should be facing up as shown to the right. When the plug is positioned correctly, it will slide in gently. Do not force. 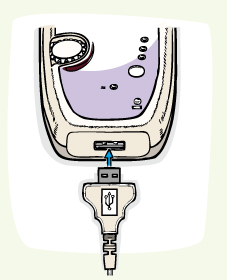 Option: If preferred, the unit can be placed in a pocket. Insert the pins on the cord into the Ear Clips. Wet the conductive rubber on the Ear Clips with water or conductive gel. Place one Ear Clip on each ear lobe, positioning the Ear Clip with the conductive rubber at the back of the ear lobe and close to the jaw. Turn the unit ON by turning the ON/OFF switch clockwise. All the lights will flash once and the unit will beep, before starting the unit in Mode 1. If the lights do not come on, the battery may not be placed correctly. Gradually turn up the intensity. The intensity should be comfortable. See ‘How It Should Feel’ below. Change modes by pushing the Mode button. The Green light indicates which Mode is selected and that the timing has started. See Output of Six Modes below for more information on modes. The unit will beep twice when the 20-minute timed session has ended. The unit will automatically cycle into Sleep Mode and the Green Mode light will flash every 2 seconds. While in Sleep Mode, the battery is still being used. To save your battery, turn the unit OFF. To turn the unit OFF, rotate the ON/OFF switch counter clockwise until it clicks. Do not force the ON/OFF switch past its natural stopping point. To do additional sessions, the unit will need to be turned off and restarted as per step 9. Wet the Ear Clips between each timed cycle. Unplug the Cord. Do not store the unit with the Cord plugged in as this can damage the Cord. Ear Clips: The Ear Clips may feel more comfortable with the use of either a conductive gel or aloe vera gel rather than water. Over time, the Ear Clips may lose their conductivity and will need to be replaced. Changing Modes: When the Mode is changed during a timed session, the timing continues without interruption to complete a session of approximately 20 minutes. Output: The Yellow light is used to test the output of the unit. During normal operation, when the unit is turned ON and the Ear Clips are positioned correctly, the Yellow light may or may not come on. As long as the current is felt, the unit is operating correctly, regardless of the Yellow light. Care of Bio Tuner Cord and Ear Clips: Occasionally, remove the conductive rubber from the Ear Clips to clean in a mild soap solution. Rinse thoroughly. If necessary, gently wipe the metal pins of the Bio Tuner Cord. Low Battery Warning: The Red light comes on and the unit will beep when the battery is low. This means the battery will soon need to be replaced. Replacement Batteries: When purchasing replacement 9-Volt batteries, take the Bio Tuner with you to ensure a proper fit, as 9-Volt batteries vary in size. a. Wet the conductive rubber of the Ear Clips again. b. Apply conductive gel or aloe vera gel to the ear lobes. c. Clean the Conductive Rubber Electrodes. d. Replace the Conductive Rubber Electrodes. With repeated use, the buzzing sensation may not be felt as much. The intensity may be turned up if desired. You may feel a sensation on one side more than the other. In rare instances, some individuals may not feel the current. Length of session: One cycle is timed for ~20–minutes. One session can be 1 to 2 cycles (20 to 40 minutes). The unit can be used daily for up to 3 sessions spaced throughout the day. It often takes at least 30 consecutive days of use to experience benefits. Length of use: The unit should be used daily, for a minimum of 4 weeks or longer. After benefits have been achieved, simply use the unit as needed. Intensity Level: The intensity should always be set to a comfortable level. Be sure to reduce the intensity before changing modes. After the new mode is selected, readjust the intensity. Sensitive skin: During the first weeks of use, the skin may become irritated. Over time, irritation usually decreases or disappears. Apply a healing lotion after use if the ear lobes become red or irritated. Stop Gradually: Reduce the amount of time each day for the last week of use. Remove the Ear Clips from the Cord. Gently pull the black Conductive Rubber Electrodes out of the Ear Clips. 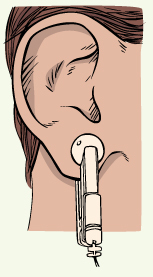 Insert the new Conductive Rubber Electrodes into the Ear Clips. Press the Electrode into place. The Bio Tuner provides six different Modes with which to experiment and discover what feels or works best. Try different Modes to determine which feels most comfortable. One Mode is not considered more beneficial than another. In all Modes, the base frequency of 1,000 Hz pulse-modulated by 111.11 Hz is present. Modes 4, 5, and 6 may have a more gentle feel. 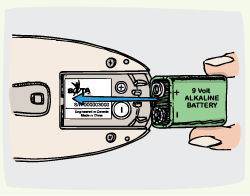 The Bio Tuner can also be operated using rechargeable batteries. When purchasing rechargeable batteries, it is suggested to take the unit with you to ensure the batteries will fit the enclosure. Maximum <1.5mA Peak ~40 Volts Peak-Peak into typical 4k ohm load. Minimum <~10uA, 10 Volt Peak-Peak at lowest setting. Output impedance ~20k ohm. 1,000 Hz (+/- 1%) pulse-modulated by 111.11 Hz (+/- 1%). Waveforms are Quartz Crystal-Controlled for precise frequency output. There is also a broad range of harmonic frequencies delivered in each pulse as observed on a frequency domain spectrum analyzer. Pulses are an alternating current (AC) output with no direct current (DC) or offset bias. Output is transformer coupled so that no DC can appear at electrodes. The manufacturing of the SOTA Products are a global collaboration. The following countries have participated in the making of the Bio Tuner (listed in alphabetical order): Canada, China, Hong Kong, Malaysia, Taiwan, Thailand and the USA. The Bio Tuner Model BT9 is covered by a three (3) year limited warranty. Please keep proof of purchase. Warranty is void if the failure is due to abuse or negligence. SOTA reserves the right to make changes to the Bio Tuner without obligation.